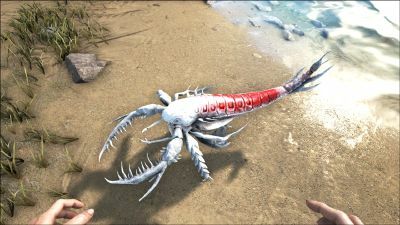 The Eurypterid (you-rip-teh-rid) is one of the creatures in ARK: Survival Evolved. Found only in the deepest depths of the waters around the Island, Eurypterids are dangerous and adaptable arthropods. As likely to hunt as they are to scavenge, a Eurypterid rarely has difficulty finding food to keep itself nourished, even at the bottom of the ocean. An Eurypterid's threat comes not directly from its raw strength. Instead, it combines a hard defensive exoskeleton with debilitating poison to powerful effect. The sting of a Eurypterid increases torpor while reducing stamina, quickly rendering its opponent unable to defend itself. While Eurypterids are not intelligent enough to be tamed, this doesn't mean they are without utility to tribes. They are a wonderful source of chitin, and their digestive tract often contains Silica pearls. They sometimes even have ingested incredibly rare Black Pearls, used by survivors for advanced manufacturing, making them among the most valuable creatures on the island. The Eurypterid moves silently along the floor of the ocean, slowly undulating its body to move through the waterways. Since they spawn in clusters of two to four, there will often be many in a single area, often around coral and seaweed. When a player approaches the area to hunt for Silica Pearl clams or for the Eurypterids themselves, the Eurypterids will swim towards the invader and attack. They can poison the player, knocking them out in the depths of the ocean, which will most likely kill them. Superficially resembles a Pulmonoscorpius with adaptations to fit an aquatic lifestyle. Its rearmost pair of legs are flattened into flippers. Instead of two separate claws, both of the forelimbs work in tandem with formidable spines, closing as a vice to trap and shred prey. Range of coloration is currently unknown. This section displays the Eurypterid's natural colors and regions. 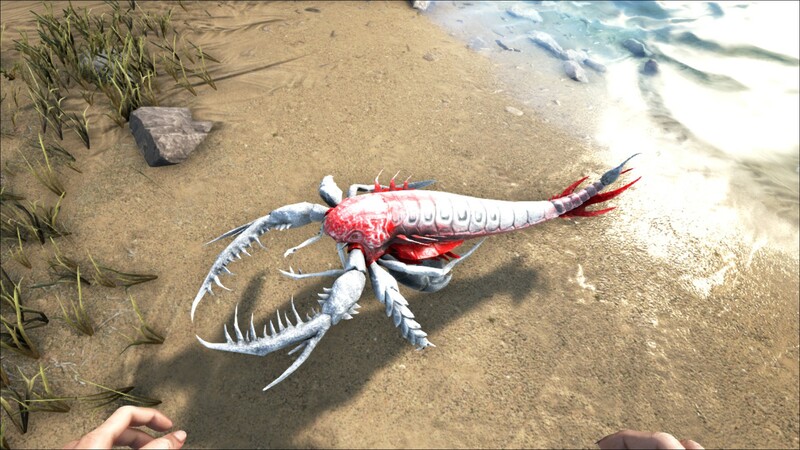 For demonstration, the regions below are colored red over an albino Eurypterid. The colored squares shown underneath each region's description are the colors that the Eurypterid will randomly spawn with to provide an overall range of its natural color scheme. Hover your cursor over a color to display its name and ID. For example, "cheat SetTargetDinoColor 0 6" would color the Eurypterid's "cephalothorax and tail flippers" magenta. 5The Eurypterid is incapable of drowning. 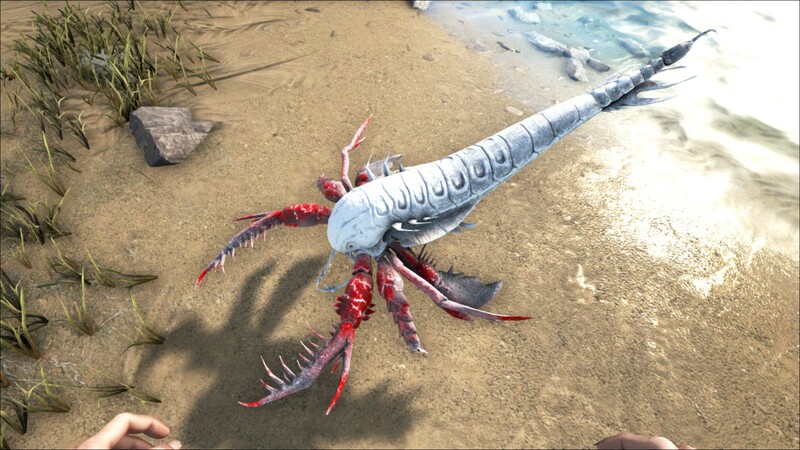 The Eurypterid attacks the target and both reduces the target's Stamina and increases Torpor by 1x the damage dealt over 3 seconds each. This effect stacks with each hit. This section describes how to fight against the Eurypterid. Eurypterids will spawn quite rarely along the ocean floor in small clusters of 2-4. They are rather small, but they can still pack a punch! The first step is locating a Eurypterid. They remain relatively hidden in the coral and seaweed underwater, so they are quite hard to find. Once found, construct a plan on how to attack without subjecting any players to the deadly poison they employ in their attacks, which can drain stamina and induce high amounts of torpor. 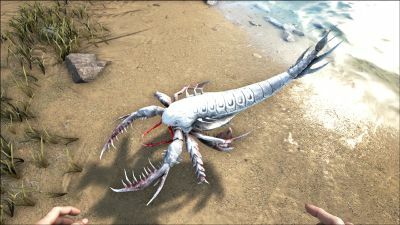 Sea mounts can be used to stay safe during killing, but large creatures cause a heavy knockback on the Eurypterids, so the area of effect loses efficiency and damage stops are enforced. The Ichthy can be used to farm the Eurypterids, because it is immune to Torpor and has no knockback, which effectively increases the damage against the Eurypterids since they will never try to flee and stay in range. Swim down to the bottom of the ocean where the Eurypterids hide, then once you find some, swim upwards. These creatures can not leave the ocean floor, so you can safely float above them and shoot them down with a crossbow. Once you've killed them, swim down and safely collect their corpses with a Metal Hatchet. If one desires their rare black pearls, be sure to collect their bodies with a Metal Pick. Employ any weaponry that, in use, will keep a player out of range of the tranquilizing attacks they deal. A pike can be used by more alert, daring survivors who have powerful melee damage. Otherwise, mounts and ranged weapons like the crossbow are your best shot. Eurypterids are small enough to be easily hidden in the ocean's many plants and reefs. Use caution when collecting pearls, as their venom causes extreme amounts of Torpor, while their actual damage is low, they can even render larger creatures unconscious easily. This can turn a simple collection mission on its head quickly. Eurypterids float barely above the seafloor, but cannot freely swim in the open water. They also have low health, so bringing a large sea mount guarantees their death. The Dossier was revealed on 9/10/15 on Steam. Although it is difficult and there is no purpose for doing so, Eurypterids can be lured to shore where they will strangely swim — almost hovering — in the air. This is most likely a bug. Eurypterids are a broad group with many members. According to the dossier, Ark's Eurypterids are from the genus Jaekelopterus - in real life, these were the largest arthropods ever known to evolve, at 2.5 m (~8 feet) in length. Real life Eurypterids did not bear stingers as the dossier depicts. Most had tails ending in simple points, although some had flattened 'flukes'. Despite appearances, Eurypterids are actually more closely related to horseshoe crabs than scorpions. 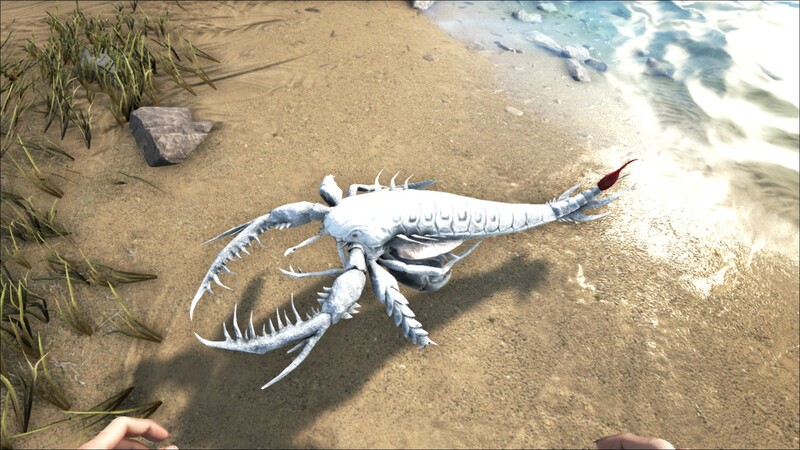 There is a noted glitch, where if you summon a Eurypterid on land, it will simply hover while acting as it usually would. In The Ragnarok map they are known to swim out of the waters of Viking Bay and tranq players. A group of Eurypterids lured to the shore and swimming in the air. ↑ Jat (10 September 2015). "Introducing the Eurypterid!". Announcements. ARK: Survival Evolved Steam Community. Retrieved September 10, 2015.